President Barack Obama's new health care law will offer subsidies to help people buy private health insurance on state-based exchanges, if they don't already get coverage through their employers. The subsidies are based on income. The lower your income, the bigger the subsidy. President Barack Obama signs the health care bill in the East Room of the White House in Washington in 2010. But the government doesn't know how much money you're going to make next year. And when you apply for the subsidy, this fall, it won't even know how much you're making this year. So, unless you tell the government otherwise, it will rely on the best information it has: your 2012 tax return, filed this spring. What happens if you or your spouse gets a raise and your family income goes up in 2014? You could end up with a bigger subsidy than you are entitled to. If that happens, the law says you have to pay back at least part of the money when you file your tax return in the spring of 2015. That could result in smaller tax refunds or surprise tax bills for millions of middle-income families. "That's scary," says Joan Baird of Springfield, Va. "I had no idea, and I work in health care." Baird, a health care information management worker, is far from alone. Health care providers, advocates and tax experts say the vast majority of Americans know very little about the new health care law, let alone the kind of detailed information many will need to navigate its system of subsidies and penalties. "They know it's out there," said Mark Cummings, who manages the H&R Block office where Baird was getting her own taxes done. "But in general, they don't know anything about it." A draft of the application for insurance asks people to project their 2014 income if their current income is not steady or if they expect it to change. The application runs 15 pages for a three-person family, but nowhere does it warn people that they may have to repay part of the subsidy if their income increases. "I think this will be the hardest thing for members of the public to understand because it is a novel aspect of this tax credit," said Catherine Livingston, who recently served as health care counsel for the Internal Revenue Service. "I can't think of what else they do in the tax system currently that works that way." Livingston is now a partner in the Washington office of the law firm Jones Day. There's another wrinkle: The vast majority of taxpayers won't actually receive the subsidies. Instead, the money will be paid directly to insurance companies and consumers will get the benefit in reduced premiums. Health care providers and advocates for people who don't have insurance are planning public awareness campaigns to teach people about the health care law and its benefits. Enroll America, a coalition of health care providers and advocates, is planning a multimillion-dollar campaign using social media, paid advertising and grass-roots organizing to encourage people who don't have insurance to sign up for it, said Anne Filipic, a former Obama White House official who is now president of the organization. The Obama administration says it, too, is working to educate consumers. "On Oct. 1, each state will have a marketplace up and running where consumers can choose a private health insurance plan that fits their health needs and budget," said Treasury spokeswoman Sabrina Siddiqui. "The premium tax credits will give middle-class Americans unprecedented tax benefits to make the purchase of health insurance affordable for everyone, and we will continue to work with consumers, community health organizations and other stakeholders to raise awareness and understanding of these tax benefits." The subsidies, which are technically tax credits because they are administered through the tax code, will help low- and middle-income families buy health insurance through the state-based exchanges. 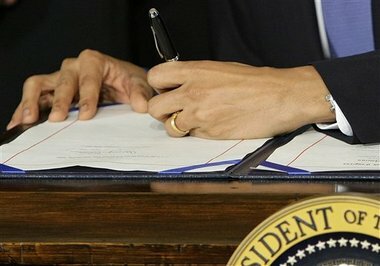 Under the new law, nearly every American will be required to have health insurance starting in 2014, or face penalties. The enrollment season starts Oct. 1. The subsidies are available to families with incomes up to 400 percent of the poverty level. This year, four times the poverty level is about $62,000 for a two-person family. For a family of four, it's $94,200. About 18 million people will be eligible for subsidies, according to the Congressional Budget Office. If families get bigger subsidies than they are entitled to under the law, the amount they have to repay is capped, based on income and family size. If they get less than they qualify for under the law, the government will pay them the difference in the form of a tax refund. There are also special rules that protect people who marry or divorce from being required to pay back subsidies just because their marital status changes. --A family of four making less than $47,000 would have to repay a maximum of $600. --If the same family makes between $47,000 and $70,000, the amount they have to repay is capped at $1,500. --If the same family makes between $70,000 and $94,200, the amount is capped at $2,500. --Families making more than four times the poverty level have to repay the entire subsidy. "It's potentially going to come as a shock to individuals who meet that criteria where their income hits a point where they owe money back," said Rep. Charles Boustany, R-La., chairman of the House Ways and Means oversight subcommittee. "The fact is, with variations in income, people could end up owing money back and that will create consternation and problems for them." The total amount of money that taxpayers will have to repay is unclear, but congressional estimates offer some clues. Twice since the health care law was passed Congress has increased the caps for how much people will have to repay. Combined, the two measures are expected to raise more than $40 billion over the next decade, according to Congress' Joint Committee on Taxation. "I think people will get there," said Livingston, the former IRS official. "They will develop instincts about it the way we all do about any process we go through multiple times. But when it's new, in the early years, this will be a real learning curve."